Over 70% of all hearing aids sold today are the behind-the-ear (BTE) style of hearing aids. The increasing popularity of this style is due in part to increased battery life and discretion, but there is a downside. Wind noise. But a new hearing aid is taking on this problem. Because of their position outside the ear, BTE hearing aids are more exposed to wind noise. Wind noise might not seem like a big deal to some people, but for people with hearing loss it can ruin a day. When you have hearing loss it takes more effort for your brain to sort through the noise you want to hear. That stress is referred to as cognitive overload. And if you add wind into the equation it can increase the mental strain of listening. In order to take on the wind challenge hearing aids have to do two things: recognize sound as wind and then reduce annoying wind sounds. 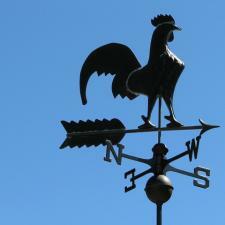 The problem with the wind is it's unpredictable and likes to change direction. Developing a hearing aid that is able to take this into account, and even determine with the wind noise an active person can create, has been a challenge. The development of smaller and more efficient digital chips has made these tasks possible. This advancement has allowed for additional algorithms to be added to hearing aids that can more efficiently recognize wind and reduce it. One hearing aid manufacturer that has taken on this wind-reduction challenge is Widex. Their Unique Hearing Aid uses what Widex calls a Wind Noise Algorithm (WNA) along with a soft level noise reduction (SLNR) algorithm. A recent study looked into exactly how well these algorithms works. A series of focused and comprehensive tests looked at noise stimuli (produced in a wind tunnel), perception of vowels and consonants, and user satisfaction at different listening levels for Widex's Unique Hearing Aids. The test, reported on by Hearing Review, showed overwhelmingly that, "...all subjects were better with WNA algorithm on at all four listening levels for phonemes, and its subcategories of consonants and vowels." This is good news for active hearing aid users! But how does this system work in the real world? Well, below is a video someone made using Unique hearing aids while riding a bike. As the below demonstration of a bike rider using Widex's Unique hearing aid show the wind sound level is significantly reduced with this hearing aid. In fact, you might have to turn up the volume on your computer in order to hear the wind in this demonstration. If you'd like to learn more about the advances in today's hearing aid technology, please see your hearing health professional. If you need help finding a hearing health provider click HERE to be connected with the largest network of trusted hearing health professionals in the nation!